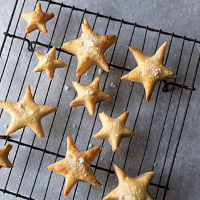 You can use our Waitrose star cookie cutters – or any other shaped festive cutters – for these pastries. Finely grate the stem ginger pieces into a bowl. Add the butter, spice and egg yolk then beat to a smooth paste. Grease 2 baking sheets. Re-roll the pastry until slightly thinner and roughly 35cm square. Use cookie cutters, dipped in a little flour, to cut out shapes. Space the shapes slightly apart on the baking sheets. Beat the egg white, then use to brush over the stars. Scatter with the crushed sugar or chopped nuts and bake for about 15 minutes until risen and pale golden. Transfer to a wire rack to cool before wrapping.